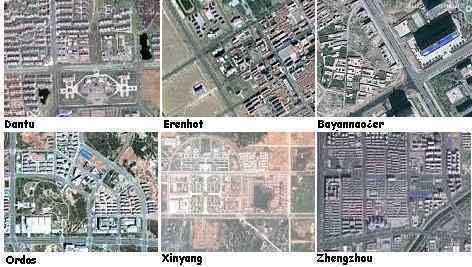 China’s Ghost Cities first hit the news in 2010 and were covered in Issue 228 of this newsletter in February, 2011. The Zetas pointed out that as a corporate effort, the ghost cities did not make sense. They were clearly to hold some of China’s vast population in the Aftertime, moving them from the coastlines into China’s interior and well away from the new S Pole - India. Indeed, the location of the Ghost Cities fits the Zeta analysis - perfect for the Aftertime. The media is still struggling to explain these Ghost Cities, and until the announcement admitting the pending passage of Nibiru, it will continue to be a struggle. 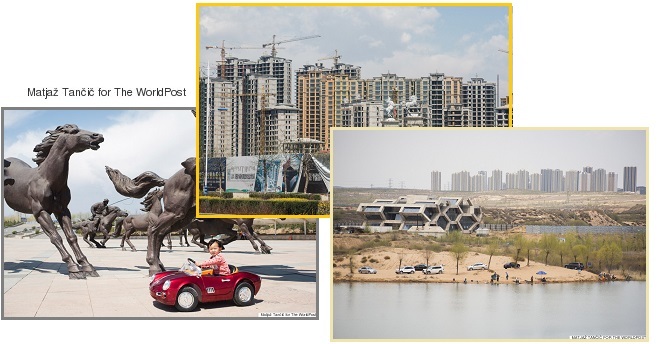 Rising up from vast deserts of northern China, Ordos is an oasis of 21st-century glamor, one that made international headlines in 2010 as a futuristic mega-city without a soul in sight. 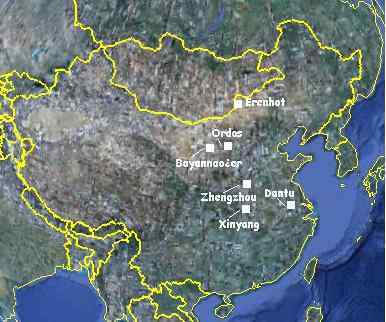 Located in the vast northern Chinese province of Inner Mongolia, Ordos is home to an estimated one-sixth of the country's coal reserves. Ambitious urban planners mapped out a new district in Ordos -- essentially a city in its own right -- called Kangbashi. Built between 2005 and 2010, Kangbashi was designed as a mix of wide-open urban space and gaudy new structures. Mile upon mile of cutting-edge architecture, including high-rises, stadiums and arts centers, sprung up from the desert sands, ready to house and entertain the expected 1 million future residents. But that human influx has been slow coming. The district’s population reportedly hovers around 100,000 people, representing huge growth compared to previous years but still just a small fraction of what the city was built for. 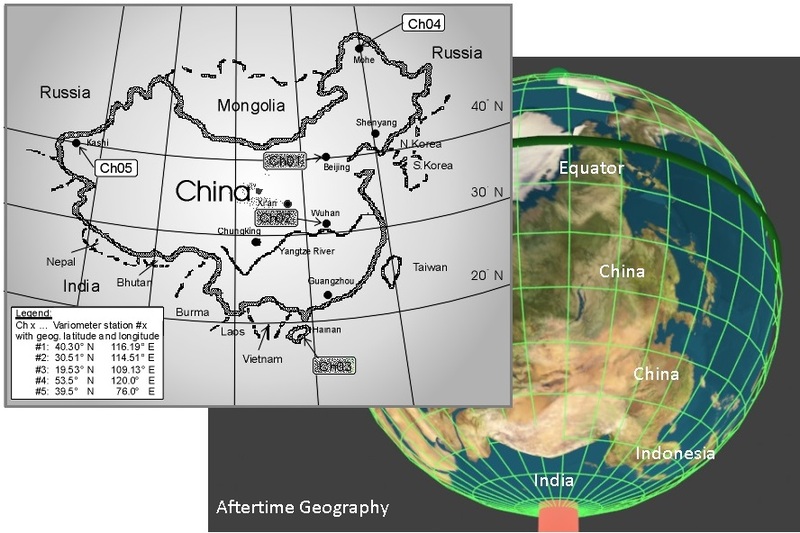 China’s present climate ranges from 20-50° from the Equator and 40-70° from the current N Pole. The Aftertime Ghost Cities will be 40-65° from new S Pole, and 25-50° from the new Equator. Very similar climate to the past, and with a very moderate climate. China has 19% or 1.4 billion out of the globe’s estimated 7.24 billion people. It is clear that China intends to care for its populace after the Pole Shift. Also given in percent is each country's population compared to the population of the world, which the United States Census Bureau estimates at 7.24 billion. India and the surrounding countries will not fare so well. 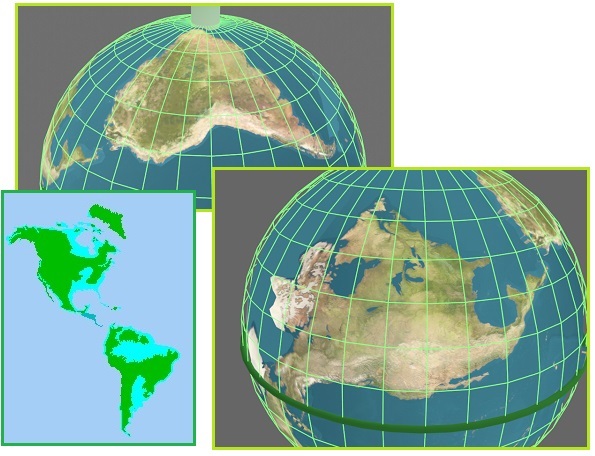 India has 17.5% of the world’s population, or 1.3 billion, and will be driven under the waves to become the new S Pole. The surrounding countries of Bangladesh, Vietnam, Thailand, Burma, Nepal, Sri lanka, Cambodia, Pakistan and Afghanistan will likewise have polar temperatures or sinking and their populations thus not expected to survive. Are these people ready to become Eskimos? Thus India and its surrounding countries, comprising in total some 26.5% of the world’s population, will perish unless they move prior to or shortly after the Pole Shift. ZetaTalk Prediction 2001: After the hour of the shift, Pakistan will find itself with a higher elevation above sea level, more ocean access as India to the east will be underwater, and additional ocean access from what we anticipate to be an inland bay cause by the ripping and sinking of the Eurasian Plate just to the west of Pakistan. Bone chilling cold will be the largest danger after the shift, as Pakistan will be literally within the polar circle. Take a clue from the Eskimos in how to dress and build homes, and take to fishing the oceans as a way of life. 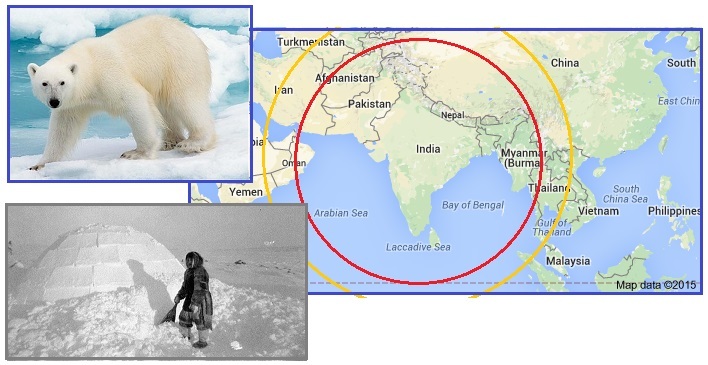 ZetaTalk Prediction 2001: Nepal rides the Himalayas, close enough to India, the new South Pole, to expect a climate not unlike Greenland or the Bearing Strait after the shift. Add to this its elevation, which will only increase due to the subducting of the Indio-Australian plate under the Himalayas, and the cold will be more intense. Thus, all in Nepal who do not move inland after the shift will freeze. ZetaTalk Prediction 2001: Used to the tropics, those survivors living close to the Bulge of Brazil will be shocked to find themselves shivering, as their homeland moves from a subtropical land to land within a polar region. Those well inland, in lands well above the backwash that the Amazon might experience during torrid rains and sloshing seas, will find their climate more moderate, hardly changing at all from what they experienced in the past. ZetaTalk Prediction 2001: All of Canada fares well during the coming pole shift, and depending upon its altitude will fare better after the pole shift than before, due to the climate changes. Canada in the main is not crisscrossed with earthquake faults of active volcanoes, and thus suffers less from the direct effects of earthquakes and exploding volcanoes during the pole shift. Due to the shifting crust, most surviving Canadians will also find themselves in a warmer climate too. Canada will be positioned above the equator in a temperate zone after the pole shift, in a warmer strata than at present. 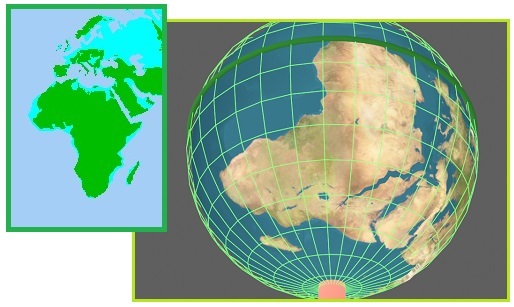 ZetaTalk Prediction 2001: The entire African continent, with the exception of some coastal areas or deep river valley's, will remain above sea level even after the poles have melted. This would seem to place it in an enviable situation, especially in light of the moderate temperate climate the entire continent will enjoy in the new geography. This must be balanced by special circumstance Africa struggles with, which will become worse before they get better. Plagues similar to the Ebola virus will spread, under the influence of the continuous rains and drizzle that run for decades after the shift, to all parts of Africa, stopped only by the seashore. The Ebola virus and its cousins live in swamps, passed among the creatures that live there, and these creatures will find all of Africa to their liking during this continuous wet season. After clear election fraud during the Scotland Independence vote and clear election fraud in the recent Israel elections, perhaps we should not be surprised at Cameron’s victory in the UK. Prior to Scotland’s Independence vote the polls showed Scotland overwhelmingly for independence. Yet somewhere between the polling stations and the counting rooms, the outcome changed. The people sense fraud, and resent in Scotland runs deep. New laws are now being invented to prevent tracking ballots to the counting room. Meanwhile, resentment deepens. Where will this lead? Police and election officials in Scotland have issued warnings to polling stations and local commanders after radical nationalists urged voters to photograph their ballot papers and follow ballot boxes to count centres. In an online campaign dubbed #OperationScallop, shared hundreds of times on Facebook and Twitter, activists have urged voters to wait until the final hour of polling so they can track their ballot papers from polling stations to count centres, in an attempt to prevent them being tampered with. But after taking advice from the Electoral Commission, polling station staff and police have also been told to ban voters from taking selfies or using cameras or smartphones in polling stations because it could be illegal. The commission said there is no law explicitly banning photography in polling stations but it believes that sharing photographs of ballot papers is illegal, breaching the legal principle that voting must be secret. The commission did not concede that images of a ballot paper could be shared after polling closes. ZetaTalk Comment 9/27/2014: Where the focus is on how the observers were kept away from the counting tables, and how ballots were placed in the wrong piles, this is looking in the wrong direction. Paper ballots can be recounted, and were recounted. Fraud thus happened before the ballots reached the counting rooms. An example is Dundee where fire alarms emptied the rooms and the vote turnout was a full 6% lower than the rest of Scotland. Edinburgh had a turnout a full 10% below the rest of Scotland. Was the weather a deterrent? Thus the will of Scotland was stolen, for the EU, for the Queen, and for the establishment in general. In the end, it will not matter, as the Pole Shift will be a great leveler. If the polling in Scotland prior to their independence vote shows a clear majority (58% vs 52%) desiring independence, the recent election in Israel showed this same spread. 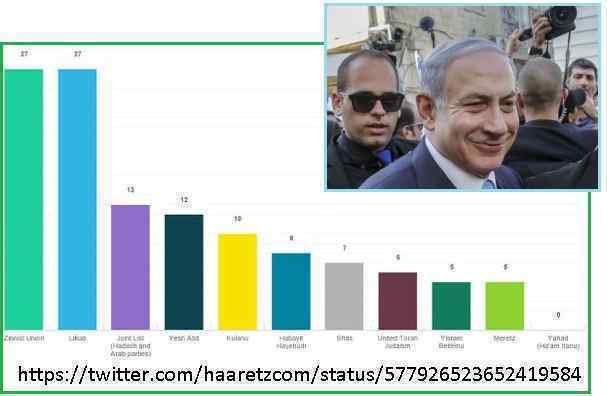 Netanyahu’s Likud party was in a dead heat with the opposition, the Zionist Union, per multiple polling sources. The opposition was gaining momentum ahead of the election. Yet during election day Netanyahu’s glum face brightened and at the end of the day we knew why. Massive election fraud was obvious but in a land where Netanyahu’s brutality is well known, the vote granting Netanyahu several more seats than expected was not challenged. But where Netanyahu thought he would rule with complete control after the elections he had called early, he is finding that to form a coalition he must make pacts with the Devil, ultra-righters who are more extreme than he, who do not hesitate to make demands. His coalition has 61 votes out of 120, so any single vote could counter his majority, and thus he must placate each and every one of them, continuously. And he has likely lost US support at the UN on the Palestinian right for statehood. Israeli Prime Minister Benjamin Netanyahu this week finally clinched a deal to form a new coalition government after his Likud party won elections last month. First, Avigdor Lieberman, formerly a close ally of Netanyahu, stunned political observers by announcing that his secular nationalist Yisrael Beitenu party would not join the coalition. As the clock ticked down to the deadline, Netanyahu forged alliances with the nationalist Jewish Home party, the centrist Kulanu party, and several ultra-Orthodox parties. He pulled off another term in power, but his coalition has the narrowest of parliamentary majorities - just one vote. Netanyahu lives from one decision to the next. He did make a mistake by calling early elections. He was playing a game of chicken. But, he wasn’t able to get the coalition he wanted because Lieberman vetoed it. Netanyahu's problem is that he veered right during the campaign to get more votes. You can’t call the center-left traitors and then form a coalition with them five minutes later. The U.S. might scale back its support for Israel at the United Nations, a significant reversal in policy after years of vetoing resolutions damaging to Jerusalem. The White House on Friday appeared to leave open the possibility of U.S. support for the resolution, without commenting specifically. ZetaTalk Comment 3/21/2015: Israel does not have electronic voting, which supported election fraud for Bush and company in 2000 and 2004. As with the Scotland fix in 2014 which the Queen ordered, it was merely a matter of substituting paper ballots. Reduce the pile for another, increase the pile for Netanyahu. How difficult would this be for the Mossad, which is famous for their skill? Those who refused to cooperate could look forward to a painful death or maiming if they refused. Netanyahu rose to power right after the pointed assassination of Yitzhak Rabin in 1995, and in his mind brutality is rewarded. Increasingly, leadership will need to be earned, to the astonishment and horror of brutes like Netanyahu. Election fraud in a democracy requires that the trail from ballot to final count be compromised in some way. During the 2000 and 2004 presidential elections in the US, this was accomplished via Diebold paperless voting machines. Diebold, a Republican company, knew how to include a paper trail, as they manufactured ATM machines. The results were obvious, but could not be challenged as the counts vaporized within computers holding the results. The counts were changed in front of the eyes of astonished election workers, changed via wifi from laptops in nearby parking lots. ZetaTalk Insight 5/16/2015: After Bush and Cheney stole the 2000 and 2004 presidential elections via the paperless Diebold voting machines, they were able to arrange the 911 debacle and invade Iraq on false pretenses, thus the Puppet Master stepped in to ensure a fair US election in 2006 and 2008 as the US was making a mess of the world. But the US, which at the time had the largest military in the world, larger than all other countries combined, was an exception. During the most recent election fraud in the UK, Cameron and his associates took care to tweak the exit polls as well as the vote. The Zetas point out that this step had not been done during the Scotland Independence vote nor during the Israeli vote, and thus claims of fraud had a stronger footing. 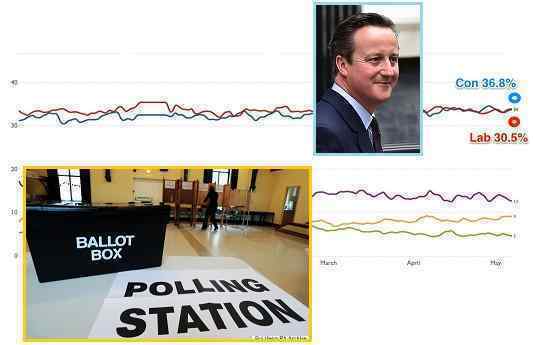 Pollsters need you to believe that Britain is a nation of liars or else admit they were wildly wrong. The average of the polls going into election day suggested that the Conservatives and Labour were effectively neck-and-neck. The release of the exit poll after voting closed was the first time people in Britain realised that things might not go as expected with the Conservatives forecast to win 316 seats, way ahead of what the polls had been suggesting, and Labour on 239, way behind what it was being projected to get. It's extraordinary that 11 polls on the eve of the election should get it so wrong. For months, the main survey-takers had the two parties neck-and-neck, flatlining at around 35 percent each. Only one day before the elections, YouGov, ICM and Survation called it a tie and three other polls published by TNS, Opinium and ComRes gave the Conservatives the narrowest of leads. 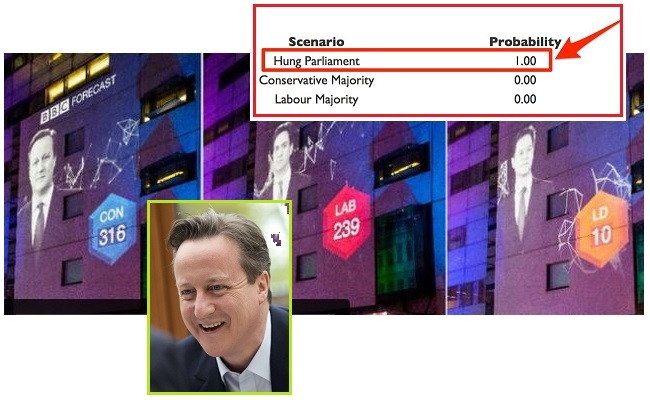 Panelbase gave the Tories a two-point lead while all the newspapers wrote that a hung parliament was a certainty. ZetaTalk Insight 5/16/2015: Clearly the recent elections in the UK were fixed, as can be seen by the long running polls showing the tight race, virtually even between Labor and the Tories. The election fraud in the UK took a page from Nethanyahu’s election fraud, where the race was likewise a dead heat. There exit polls showed that Netanyahu had not won, so Cameron took pains to ensure his exit polls matched the fraudulent result. How is this accomplished when the pollsters are running about like mice in a grainery on election night? If there are many pollsters, the point where the exit polls are consolidated is a single point, usually at a computer, usually with a single person at the controls, and the threat of a painful maiming or the offer of a substantial bribe seals the deal. Now what. The Zetas have predicted in the past that where dictatorships or essential dictatorships exist today they will become more harsh, but where the populace is used to democracy, martial law or dictatorships (the theft of democratic rights) is not tolerated for long. In this case, wither Israel or Scotland or Cameron’s UK? Per the Zetas, polarizing of the orientation has increased, but this will not benefit the ultra-right election thieves for long. David Cameron will use the Conservative Party’s first majority in the House of Commons for nearly 20 years to “deliver” on a radical agenda to cut welfare, shrink the size of the state and re-define Britain’s relationship with Europe. Among Mr Cameron’s first legislative priorities will be to enshrine an EU referendum into law, bring in the so-called ‘snoopers charter’ to give police greater powers to monitor internet communications and give English MPs a veto over legislation only affecting England. The Tories also intend to publish plans to scrap the Human Rights Act within their first 100 days. All proposals had been previously blocked by the Lib Dems. Cameron, having achieved a smashing and unexpected outright victory in Britain’s general election, heads into his second term facing severe challenges to his nation’s identity and place in the world: how to keep the United Kingdom in the European Union and Scotland in the United Kingdom. In vanquishing the opposition Labour Party and winning an absolute majority in Parliament, Mr. Cameron gained the right to govern without a coalition partner, allowing him to claim a mandate to pursue his own agenda. But his majority is so narrow that it will force him to tread carefully with his own fractious legislators to pass legislation and address issues that could fundamentally redefine 21st-century Britain. ZetaTalk Insight 5/16/2015: Election fraud, which had always been a factor throughout the ages, is increasing around the world because of the increased polarization of the orientations. Those in control, the elite, fear being displaced during the coming Earth changes. When does a democracy become a dictatorship, and how does it function afterwards? A dictatorship has a cleaner process. The dictator can simply execute anyone who opposes him. The man who steals an election in a supposedly democratic country has a more muddled mess as he must find allies, negotiate with them, and make concessions. Nethanyahu anticipated an ultra-right coalition when he called for early elections, but what has he really secured? We predicted he would move to martial law eventually, to assuage his hunger for complete control of Israel. He now has such a narrow majority, just one vote above what is needed, that he is subject to blackmail on every imaginable issue by his coalition partners. He is ruled now by those more highly Service-to-Self than he! Cameron is faced with the same situation, having to squabble with other ultra-right parliamentarians at every step. Concessions with liberal groups is easier, as they are usually only asking for basic rights and are eager for any gains at all. Concessions with the ultra-right, especially when they see they have control, becomes very polarized, where there is no end to the vicious demands, no end to the greed, and in particular no end to the demands for more control. It is a view into the Hell awaiting these souls when they end this incarnation and move onto the prison planets that await them. In the meantime, the public, watching this drama, is less and less likely to ever follow their lead.